The Lottery grant for the park included some money for artwork, and the project team decided to commission a piece to stand in front of the young children's play area. The village was consulted to get some idea from a list of suggestions ie classical, humorous, family, abstract, etc. Perhaps inevitably, the community divided its votes evenly between all the categories, so in the end the team had to make a decision. Following research into the work of a number of sculptors, Ben Greenwood was eventually commissioned to design and produce the work. Ben began his career at Aardman Animations, working on 'Creature Comforts', ‘Tortoise vs. Hare’, and 'Wallace and Gromit: Curse of the Wererabbit', before venturing back up north to work on Tim Burton's 'The Corpse Bride'. He is now a freelance artist and sculptor and is well known for his 'totem' style pieces. 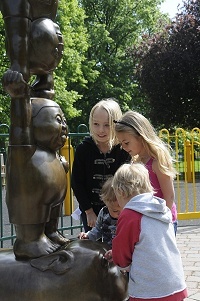 The sculpture now in the park was developed from an original idea put forward by Ben following meetings and discussions with the project team. It integrated the themes of children at play, water, dog walking, the park's history and wildlife (look for the bat and the 'Q' on the children's pockets). The project team followed the process from Ben's initial clay maquette, through the preparation of the rubber moulds, to the final casting by Le Blanc Studios near Melton Mowbray. When installed a few days before the official opening of the park on May Day 2011, the sculpture was an instant hit. It quickly became known as 'The Handstand' and has now become the Stafford Orchard logo, used on the entrance flag, staff and volunteer sweatshirts and caps, letterheads, and on all marketing and advertising material for the park. Select each image to view an enlarged version. After some initial discussions, Ben Greenwood start to put ideas onto paper. Members of the project team meet with Ben Greenwood (the sculpturer) in Od'Thorpes, Quorn. The clay maquette is visible on the table. Once the concept was agreed, it had to be translated into a life-size design in clay. The design was too large to cast economically in one piece, so individual moulds of the main design elements are made which would be joined at a later stage. Molten metal is poured into each mould. Standing next to his creation shortly after installation in the park. A group of children get the first opportunity to examine The Handstand in detail.